Once, a young woodsman was out hunting for wild ducks when he heard a sudden whirring of wings and looked up to see not ducks but seven graceful swans alight on the bank, cast aside their guises, and begin to bathe and sport in the water. Enthralled by their beauty, the young man snuck forward and stole one of the discarded garments which, to him, looked like a feathered white cape. Once the maidens had finished their bathing, they gathered together again on the water-bank and retrieved their robes, preparing to leave. However, the youngest was distraught for she could not find hers. "Alas, dear sister, we cannot stay!" lamented the others and flew away without her, eastward into the dawn. After a time, the hunter approached the poor weeping maiden, holding the feathered robe tied to her fate. She begged piteously for its return, but the man, already too much in love, refused. “Nay, fair maid, for I would have you for my wife,” said he, covering her with his own woolen cloak and leading her to his home in the forest. For seven years they lived together as husband and wife, and the maiden who longed for cool waters and to fly on wings of snowy down had gifted her captor with two children, a boy and a girl. Then, one day, while playing hide-and-seek with her brother, the little girl found hidden a strange, sparkling white garment made of soft feathers. Curious, she brought the treasure to her mother sewing by the hearth who instantly dropped her needlework to wrap herself in the familiar folds. 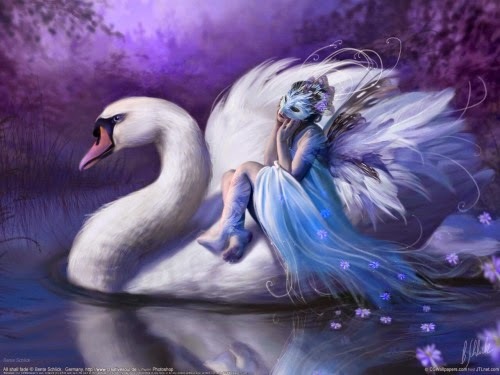 For a moment, a joyous sigh escaped her lips and then she was a swan once more, beating her strong wings on the wind of freedom, and flew out the window never to be seen again. No matter how compliant a swan maiden may appear as a wife, there remains an unspoken anxiety and tension beneath the surface of her marriage. Her husband can never be certain of her affection, for it has been held hostage by her stolen skin. He offers her his cloak, but it is an exchange of unequal goods. Her feathered robe is the sign of her wild nature, of her freedom, and of her power, while his cloak becomes the instrument of her domestication, of her submission in human society. He steals her identity, the very thing that attracted him, and then turns her into his most precious prize, a pale version of the original creature of magic. 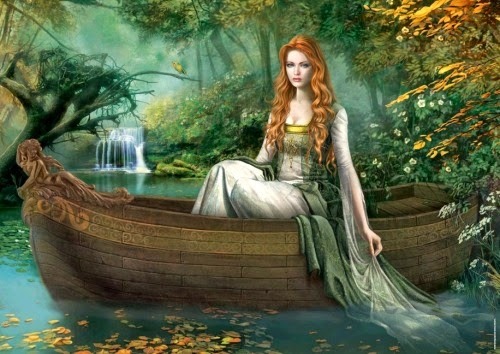 Can we love the swan maiden? She seems to offer both an image of feminine power and feminine weakness: a girl who submits to the deceptions of a suitor and a woman who rejects the terms of an unfair marriage. She is at once a doting mother and one who will happily abandon her children in favour of her own needs. Her ambiguous tale can be read as the suppression of women’s rights and women’s creative power through enforced domestication, but it can also show such a woman’s resolve to not only survive a questionable marriage but to remain true to her nature. 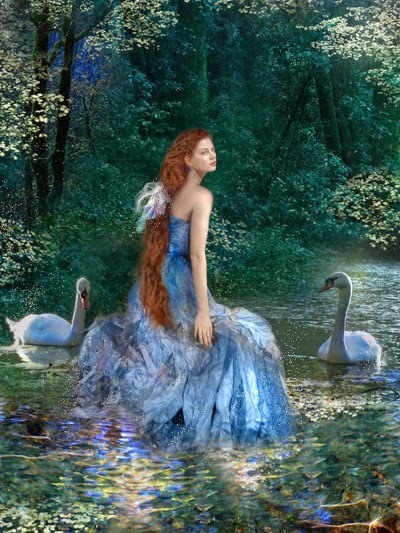 When given the chance, no amount of suppression can keep the swan maiden down. I feel a terrible tenderness for the youngest swan–girl, abandoned by her sisters to her fate on the ground. 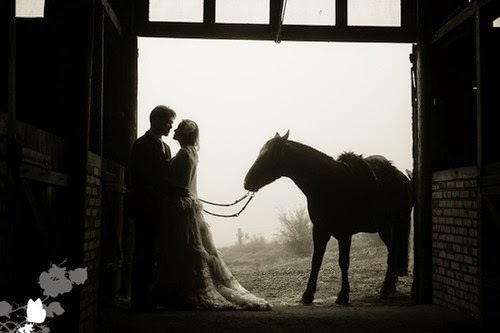 I want to shelter her from the routine ordinariness of her human marriage, given over to the demands of others. And I want to cheer, relieved and inspired, when she finds her own true self again, and rises to soar. Artwork: Blue Belle, by Gale Franey.